The most impressive collection of offshore racing hardware from across the globe is set to gather off Cowes for the start of the biennial 605 nm Rolex Fastnet Race on August 3. Following the 340 available places in the IRC fleet selling out in just four minutes and 37 seconds when entry opened on January 7, the Royal Ocean Racing Club, organisers of this, the world’s largest offshore yacht race, has provided a sneak preview of the 2019 line-up. Entered at present are 25 Class40s (plus two more in the IRC fleet). There are also set to be a handful of Ultimes. At 100ft long, these maxi trimarans are the world’s largest and fastest offshore race boats. The present race record for the Rolex Fastnet Race was set in 2011 by the 130ft trimaran Banque Populaire V, skippered by Loïck Peyron, in a time of 32 hours 48 minutes at an average speed of 18.5 knots. While shorter, any of the new generation Ultimes is capable of bettering this time. IMOCA 60s have been in the news in recent months as they are one of the classes set to be used for the next running of The Ocean Race (ex-Volvo Ocean Race) over 2021-22. The Rolex Fastnet Race line-up includes an unusually large number of British female skippers taking part, among them Initiatives Coeur’s Sam Davies and former Mini and Class40 sailor Pip Hare. In sheer numbers, the IRC fleet should once again be huge. At present the maximum entries has been comfortably exceeded although the exact number making it to the start will fluctuate due to circumstances, not least the requirement to comply with the RORC’s race qualification requirements. Among the fleet are many past winners. This includes the reigning Rolex Fastnet Race champion, Didier Gaudoux, who returns with his faithful JND 39 Lann Ael 2. Conversely, returning with yet another new boat is 2015 winner and race veteran Géry Trentesaux, back this time on the bigger version of his victorious Courrier Du Leon, the JPK 11.80 Courrier Recommande. Given that French boats have won the last three editions of the Rolex Fastnet Race outright, it is no surprise that after the UK, French boats are second largest entry this year – with 58 in the IRC fleet, plus an additional 35 or so in the non-IRC classes. At present class splits are a long way off being decided, but it is these classes themselves, and not the overall prize, that provide the most serious competition within the Rolex Fastnet Race. However, already identifiable are groups of similar boats, due to have exceptional competition on the biennial 605 nm race from Cowes to Plymouth via the Fastnet Rock. Perhaps the most intense battle in the IRC fleet will be between the seven Cookson 50s, including the fastest – American Ron O’Hanley’s Privateer. One example, Ger O’Rourke’s Chieftain, claimed the Rolex Fastnet Race outright in 2007. Also to be watched in this size range are the TP52s – Outsider, Tala and Rockall V plus Frenchman Eric de Turckheim’s Nivelt-Muratet 54 Teasing Machine, winner of the 2017 RORC Transatlantic Race. The previous Teasing Machine, de Turckheim’s Commodores’ Cup-winning A13 is also competing now as Mark Emerson’s Phosphorus II. A large gathering of J/Boats range from the J/133s, Yves Grosjean’s Jivaro and Gilles Fournier and Corinne Migraine’s Pintia, down to the four J/105s and the fifteen J/109s, spanning the RAF Sailing Association’s Red Arrow (with an IRC TCC of 1.025), to Peter Rowe’s Ju Kyu (on 1.003), via J/112s, J/120s and a large gaggle of J/122s. Beneteau is also well represented with thirteen First 40s set to be on the start line and an additional eight First 40.7s. However, all eyes will be on the latest hardware from St Gilles Croix de Vie – the Figaro 3s, complete with their IMOCA 60-style foil packages. Three examples are entered including the Will Harris-skippered Hive Energy and from Ireland, Conor Fogerty’s Raw. 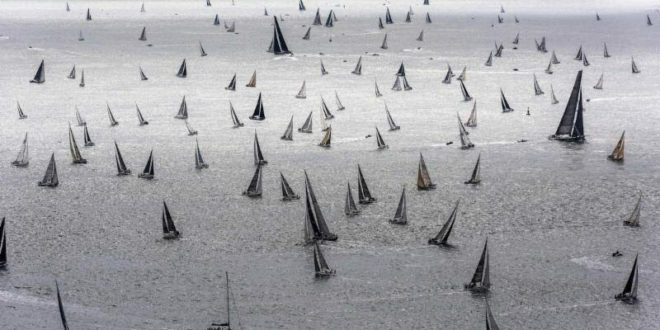 Background: The biennial 605 nm Rolex Fastnet Race is organized by the Royal Ocean Racing Club (RORC) with just 7 boats sailing the first race in 1925. A record-sized fleet of 362 boats started the 2017 race, 12 more than 2015, with the 2019 race to be the 48th edition when it starts on August 3.